When a waitress at The Cellar asks Boo and Junior to scare her roommate Dana's harassing ex-boyfriend, Byron, Boo's white knight impulses kick in and they perform the job with gusto, leaving Byron bloodied but very much alive. So when Byron is found dead, they're shocked. They're even more shocked when they learn that nothing is what they originally thought, and they're being held accountable in the man's death. With Junior called in for questioning, Boo is determined to clear their names by finding Byron's true killer. It's a quest in which Boo will have to face down crooked cops, crazed guard dogs, a rival security crew, the Irish mob and--worst of all--his own ingrained prejudices. 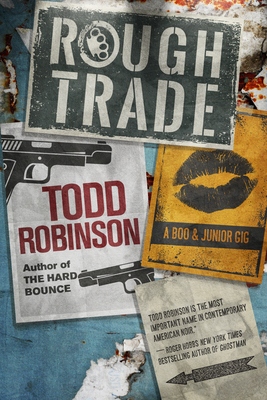 Action-packed, outrageously funny, and brutally honest, Rough Trade brings back crime fiction's favorite bouncers and takes them well out of their comfort zone in a novel that's whip-smart, hilarious, gritty and above all human, proving that Todd Robinson is one of the most important voices in crime fiction. Todd Robinson is the creator and chief editor of the multi-award-winning crime fiction magazine Thuglit. His short fiction has appeared in Blood and Tacos, Plots With Guns, Needle Magazine, Shotgun Honey, Strange, Weird, and Wonderful, Out of the Gutter, Pulp Pusher, Grift, Demolition Magazine, and CrimeFactory. His writing has been nominated for a Derringer Award, short-listed for Best American Mystery Stories, and selected for Writers Digest's Year's Best Writing 2003, and it won the inaugural Bullet Award in June 2011. His first novel featuring Boo and Junior, The Hard Bounce, was nominated for the Anthony Award. He lives in Queens, NY.